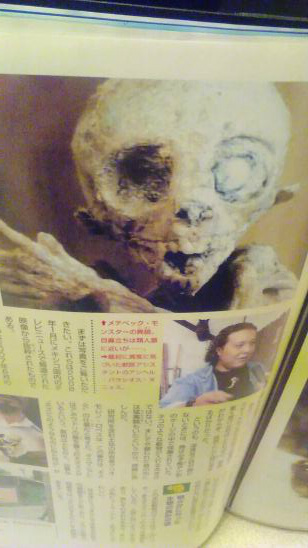 HERE IS A PICTURE OF AN ALIEN corpse. This little guy was captured in Mexico, close to Mexico City. He was caught in a small animal trap, and could not get lose. The "creature" was sitting there and screaming. The farmer who captured him did not want to let him lose, so he tried to drown, while still cougth in the trap, him in a nearby creek for 10 minutes or more. When the farmer pulled the creature out of the water, the creature was still alive. So he threw it in the water again and left it for several hours. It killed the creature. There have been done genetic testing on it and it an unknown.